It’s been 30 years since Yogen Früz® opened its doors, serving healthy and delicious frozen yogurt to consumers, and we want to celebrate Yogen Früz® and all it’s success! We want you to show us your creative side! In celebrating our 30th Birthday, we want our loyal customers and fans to design a new cup for us! Create your design on the printed template or your cup after purchase. Entries may be drawn or digitally created. The winner will also be featured across all our social media and website, have their cup put into production and used at stores across Canada, the United States of America and Puerto Rico, be given keepsake version of their cup design and receive a swag bag full of goodies and gifts! 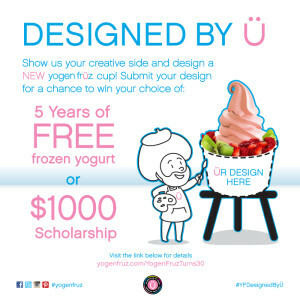 We are accepting submissions until April 29th, 2016.
on’t forget to include hashtag, #YFDesignedByÜ in order to be entered! Good Luck Früz Nation Designers!